In West Virginia, monuments are quirky and occasionally dedicated to fictional figures – maybe. It’s a challenge to decide whether John Henry or Mothman is the most fictitious. Mothman may be an implausible monster, but there are numerous people still living and working in Point Pleasant who claim to have seen it. John Henry has a famous song. Mothman has an impressive statue in the center of town, a major Hollywood movie and an authentic disaster. Widely known through folk tunes, the steel-driving John Henry was memorialized by a larger-than-life bronze statue—2.5 tons and eight feet tall, to be precise—in a small park above Big Bend Tunnel in Talcott. John Henry allegedly challenged the railroad’s track-building machine a century earlier and collapsed after beating the machine, never to work again. 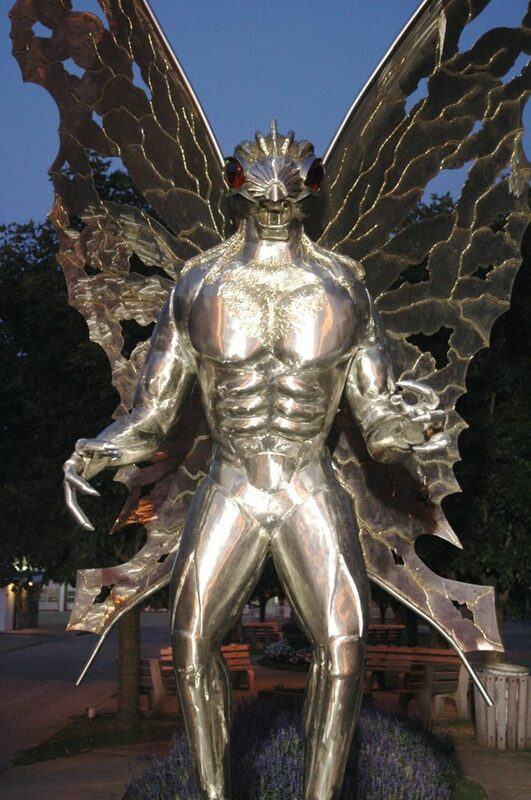 In 2003, Point Pleasant erected a locally sculpted seven-foot stainless steel statue of Mothman complete with wings and glowing red eyes. If the town established a photo fee, they could probably eliminate taxes. The accounts describe encounters with a giant winged creature from 1965-68 in and around Point Pleasant. During the midst of the sightings, on December 15, 1967, the collapse of Point Pleasant’s Silver Bridge and the resultant deaths of 46 people was the worst bridge disaster in U.S. history. Soon after the collapse, Mothman disappeared. Did Mothman cause the bridge collapse, or come to warn of it? Also linked to the Silver Bridge disaster is one of West Virginia’s monuments to its Native American roots. Cornstalk was one of the great Shawnee chiefs and leader of the Northwestern Confederacy of native tribes. In October 1774, he led nearly 1000 Shawnee and other warriors to engage an equal number of Virginia militia in a fierce daylong battle. Hundreds of Indians and Virginians were slaughtered in the hand-to-hand combat. Cornstalk led his men away undefeated but was later murdered by Americans. Legend has Cornstalk cursing Point Pleasant with his dying words. The collapse of the Silver Bridge within sight of the historic battlefield is linked to his curse. Today, the four-acre Tu-Endie-Wei State Park is dominated by an 86-foot granite obelisk honoring the fallen Virginians. A smaller monument was erected to Cornstalk with his bones in a metal box at its base. Later rest rooms were placed nearby, hardly a way to relieve the curse. Deep in Monongahela National Forest at Mingo in Randolph County there is a large statue of Chief Logan of the Mingo tribe. A little further along the same road is another historic statue which questionably claims to be a rare, clean-shaven, young Robert E. Lee. Logan trumps the possible Lee being both clean-shaven AND bare chested. We’ll never know if Logan was as “ripped” as the statue makes him. For more than a century, Devil Anse Hatfield starred in print media as patriarch in America’s most famous feud. Then came Kevin Costner and the History Channel’s award-winning mini-series “Hatfield and McCoys. ” Fortunately, Devil Anse’s life-sized Italian marble statue in the family cemetery near Sarah Ann is sufficiently impressive for an enduring global superstar. George Washington’s Bathtub, the world’s only outdoor monument to presidential bathing, is appropriately located in Berkeley Springs State Park where Washington visited often to “take the waters.” Promoters acknowledge the hollow lined with stone and sand that encloses one of the noted springs is a “historic re-enactment” of conditions when Washington first came to bathe in the 1750s. George Washington’s Bathtub always puts a smile on visitors’ faces and is a hugely popular photo opportunity. Three unusual monuments celebrate air and space travel, not usually attributes connected to West Virginia. America’s first memorial to an aviator celebrates Weston native Louis Bennett Jr, organizer of the West Virginia Flying Corps who was shot down during World War I. The bronze figure on a granite base in Wheeling sports period leather helmet and goggles as well as a surprising pair of full-sized wings. Native son Chuck Yeager was the first man to break the sound barrier in an airplane. His impressive monument is a white-tipped rocket, erect and ready to fire. Jeanne Mozier is an author living in Berkeley Springs. Learn more about the Mountain States oddities and wonders in her popular book, “Way Out in West Virginia,” now in an expanded and updated 4th edition available from WV Book Company.